Eagle Vision s new SD Blu-ray range presents upscaled standard definition original material with uncompressed stereo and DTS-HD Master Audio surround sound for the best possible quality. Barry, Maurice and Robin Gibb were performing together from childhood but it was in Australia in 1960 that they were first billed as the Bee Gees. The band went on to become one of the most successful performing, recording and songwriting acts of all time. This full length concert was shot at the MGM Grand in Las Vegas on 14 November 1997 and is one of very few Bee Gees performances ever filmed. Now for the first time it has been fully restored with remastered sound and will be released on a Blu-ray disc as the first of Eagle Vision s new SD Blu-ray range. 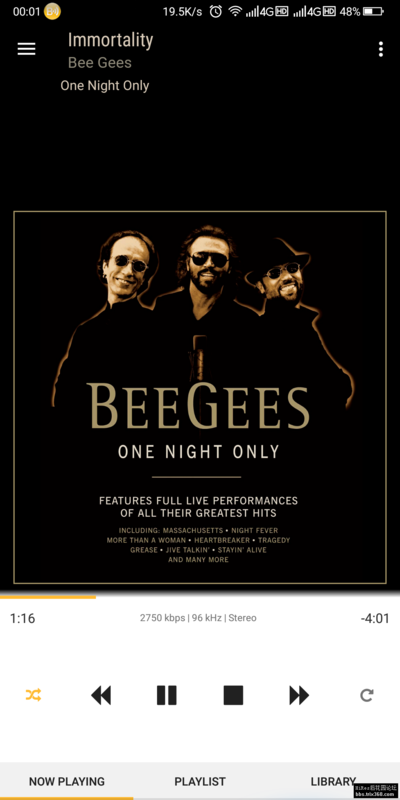 Taped as a lavish cable television special in 1997, One Night Only trades on the Bee Gees’ shape-shifting career as pop survivors. Over the course of 111 minutes, this straightforward concert, produced at the MGM Grand in Las Vegas and groomed for both video and CD posterity, sprints through 31 songs from their past three decades. Even after the inevitable disco jokes are expended, and the jaundiced viewer contemplates the role hats, hairspray, and comb-overs now play in dressing the once stylishly long-haired troika, the Gibb brothers’ signature vocal harmonies and hook-laden song craft beg respect. Casual listeners can’t be blamed for equating the Bee Gees with the dance floor bonanza they reaped through 1978′s Saturday Night Fever, yet that commercial zenith was actually the culmination of a comeback for a group that had seemed washed up by the early ’70s. One Night Only thankfully takes an even-handed view of both their original late ’60s hits (“Massachusetts,” “To Love Somebody,” “Lonely Days”), building from a cannily Beatle-browed vocal sound, and the ’70s blue-eyed soul (“Jive Talkin’,” “Nights on Broadway”) that led them naturally into disco. 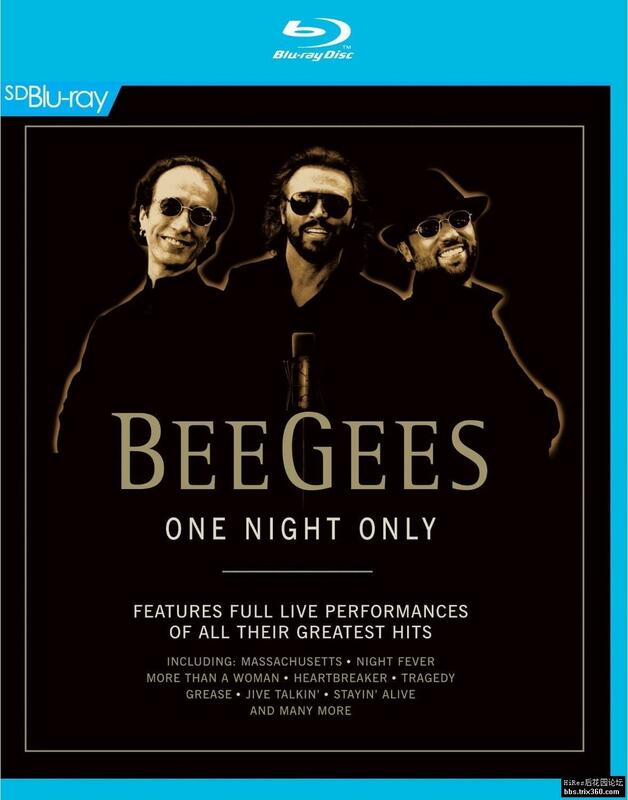 The Fever hits are here, as are Gibb originals that clicked for other acts; the family circle also widens for a posthumous duet with their late brother, Andy Gibb, while Celine Dion gets star billing in the collaborative “Immortality.” –Sam Sutherland –This text refers to the VHS Tape edition. The Brothers Gibb perform their greatest hits from the ’60s to the ’90s in a concert filmed at the MGM Grand in Las Vegas, their first U.S. concert in nearly 10 years. In addition to their smash hits, the Bee Gees perform songs written for and made hits by other artists. Songs: You Should Be Dancing, Alone, Massachusetts, To Love Somebody, I’ve Gotta Get a Message to You, Words, Closer than Close, Islands in the Stream, One, Our Love (Don’t Throw It All Away) [a special duet with their late brother Andy Gibb], Night Fever/More Than a Woman, Still Waters, Lonely Days, Morning of My Life, New York Mining Disaster 1941, Too Much Heaven, I Can’t See Nobody, Run to Me, And the Sun Will Shine, Nights on Broadway, How Can You Mend a Broken Heart, Heartbreaker, Guilty, Immortality (with Celine Dion), Tragedy, I Started a Joke, Grease (with Frankie Valli), Jive Talkin’, How Deep is Your Love, Stayin’ Alive, You Should Be Dancing.